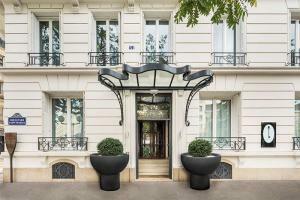 Experience innovative design and a warm welcome in Paris' Latin Quarter. Set within an an elegant Haussmannian building, the hotel's 42 rooms reflect four sophisticated design themes, fusing white, yellow, blue and pastel shades to create an ambiance of comfort and relaxation. The hotel is just a stone's throw from the Jardin des Plantes, the Natural History Museum and the charming Marché Mouffetard. Unwind in the hotel's two spacious lounges or at the fitness and wellness area, which includes a Turkish bath. Orly Airport is about 7 miles from the hotel, and Roissy-Charles de Gaulle Airport is 15 miles away.